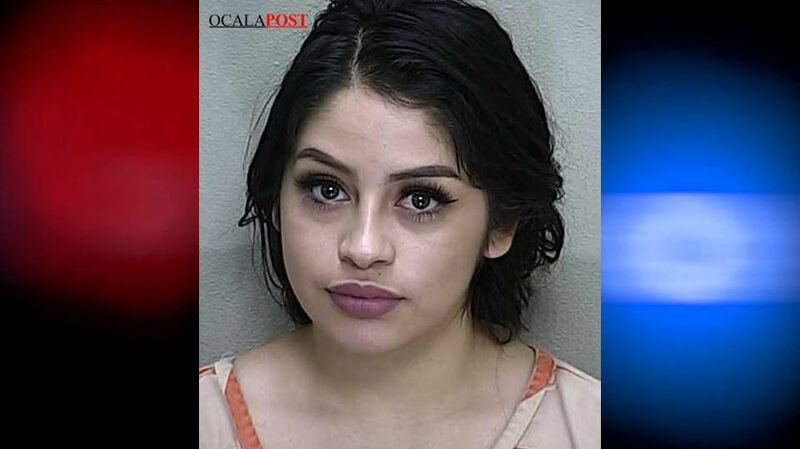 Ocala, Florida — An 18-year-old woman was arrested after she assaulted a 13-year-old. A Marion County sheriff’s deputy responded to the 100 block of Southeast 81st Place, Ocala, after a caller reported an assault. The victim told the deputy that she was in the shower when Reyvic Paz came home. The victim said that when she got out of the shower she went into the living room, at which time Paz began screaming at her. According to reports, when Paz would not stop yelling, the 13-year-old yelled and told her that she should leave. Paz then “became irate” and threw a bottle of lotion at the victim, which hit her in the forehead. Paz then grabbed the victim, slammed her onto a small table, and bit her on the left arm. A witness stated that Paz continued to punch the victim in the head after she bit [her]. The witness told the deputy that he was screaming at Paz to stop, at which time she got off of the victim and fled the house. The witness stated that Paz had come home to retrieve some of her belongings, and was mad at the entire family. Paz told the deputy that when the victim told her to leave, she decided “she had enough of [the victim] yelling at her. “So I hit her in the head,” Paz told the deputy. Paz was arrested and charged with Domestic Battery.